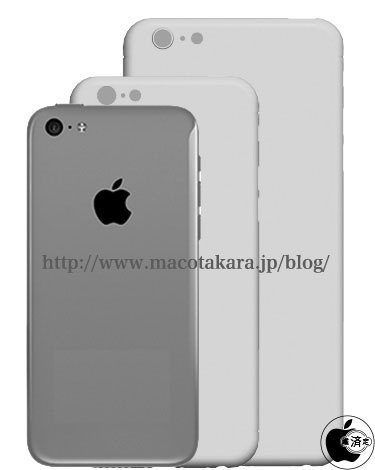 There will be a possibility of the high-end model of iPhone 5c series at next term iPhone of a large-scale screen. It is spoken that the possibility of these two sizes of the liquid crystal are the final candidates is high from speaking sources of information that can trust it though Reuters were telling whether to be going to adopt two liquid crystal displays of 4.7-inch liquid crystal display and 5.7-inch liquid crystal display at next term iPhone in June, 2013. It has been understood that the possibility to be planned as a variation model of iPhone 5c is apparently high though we thought these large-scale liquid crystal displays to be adopted as an evolution version of iPhone 5s who is the high-end model. The camera turn of the large-scale screen model looks like iPhone 5c, and it predicts it from the thing that the hole in the volume control Paeonia suffruticosa Andr. and the bottom side on the aspect side design etc. resemble closely. 4.7-inch model is predicted that both about 14cm in length, about 7cm in width, and about 16cm in length, and about 8cm in width 5.7-inch model thickness is 7mm. Moreover, the reason is not understood though 5.7-inch liquid crystal display model becomes a packaging method like iPod touch (5th generation) the processing of the camera, and shoots out from the case a little. As R shape on the back is adopted on the surface, and the possibility of adopting the design to which the entire aspect did R shape is as high as iPod nano (7th generation). R seems to be put on the edge of the glass adopted on the surface to install the liquid crystal display by this size, and to challenge the technology that matches it to the main body case. However, the possibility of changing into a new design will still have gone out of the annulment once though it is not possible to say, and iPad Air was developed at first by 7mm thickness, and becoming 7.5mm thickness to these with the final design in the future, too. The current model is not replaced from these but it is predicted that iPhone 5c model lineup is expanded.